In this era of big data, backups of your servers are more important than ever. This is why Combell introduces a new offsite backup service for servers that integrates effortlessly and seamlessly with Veeam’s software. What are the benefits of Combell’s Veeam CloudConnect Backup Service? This rule states that you should store three copies of your data, on two types of storage media, of which one copy should be stored offsite. This last part is a real challenge because of the important network bandwidth that such backups require, especially now that companies are becoming increasingly more data-intensive. But with Combell’s Veeam Cloud Connect Backup Service, you can apply this basic rule without having to invest in infrastructure for bandwidth or for a second backup location. By choosing Combell, you can immediately have an online backup of your business-critical data available in a secure and redundant data centre. This way, you always have a synchronised backup at your disposal, which you can restore in a secure manner in your local infrastructure, whenever necessary. Traditional backup tools have been designed for a physical world. When virtualisation was introduced, these tools have been updated, but they are still mainly designed for physical machines. So, the possibilities offered by these traditional tools are quite limited for virtual environments. Veeam’s software, on the other hand, has been designed from the very beginning for virtual servers. We will elaborate on the 10 benefits of Veeam Backups in a follow-up article. Why your offsite backup at Combell? Combell has more than 15 years of experience in hosting and secure storage of business-critical data for its customers. Thanks to our specialisation, we have network and storage capacity available for all sorts of demanding applications. Guaranteed availability of your backup thanks to our redundant data centres. Unlimited data traffic for uploading and downloading your backups. So, you do not pay for bandwidth, but only for the required backup capacity that you can adjust to your needs. A modern backup architecture for Veeam Cloud Connect with built-in WAN acceleration without additional costs. 24/7 free support, day and night, via the free 0800 number or via e-mail. 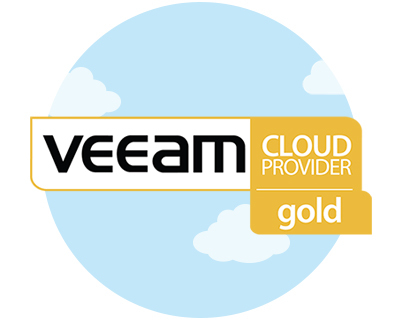 The best service and the best guarantees at the best rates, because Combell is a Veeam Gold Partner. Quality and security are guaranteed – with Combell’s ISO 9001 & 27001 certificates, your data are secure with us. End-to-end encryption: all the data are encrypted before transmission. If you are not using it yet, you need to install Veeam’s software that makes your local backups. a) The number of virtual servers you need, i.e. the number of servers for which you want Combell to store an offsite backup (minimum 1). b) The number of storage packages you need, i.e. the amount GB that Combell needs to provide for storing the virtual servers’ offsite backups (minimum 1). In the Veeam Cloud Connect feature (available from version 8 of Veeam) of your backup software, enter the data Combell provided you with. You are done: from now on, your external backups will be created automatically. You can restore a backup via your console in the Veeam software, without manual intervention from Combell. Do not wait any longer: request your Veeam Cloud Connect Backup Service subscription and make your first offsite backup with your Veeam backup software!